This week, we’re thrilled to feature another beautifully designed app that’s using Realm for an absolutely excellent cause. Apple tells us time and time again that the iPhone is one of the best cameras out there. It’s a camera we constantly carry with us, and at the drop of a dime it’s very easy to quickly pull it out and snap a photo. It’s no wonder Flickr reports that more photos are uploaded to their service by iPhones than any other camera! With all that said and done, sadly the experience of managing all these photos on an iPhone isn’t as great as it could be. Photos are simply dumped in one massive scrolling view called the “Camera Roll”. More sorting options were added in iOS 7, but it remains quite a cumbersome thing to manage, and you still have to manually navigate a large collection of photos. Sadness, and frustration. 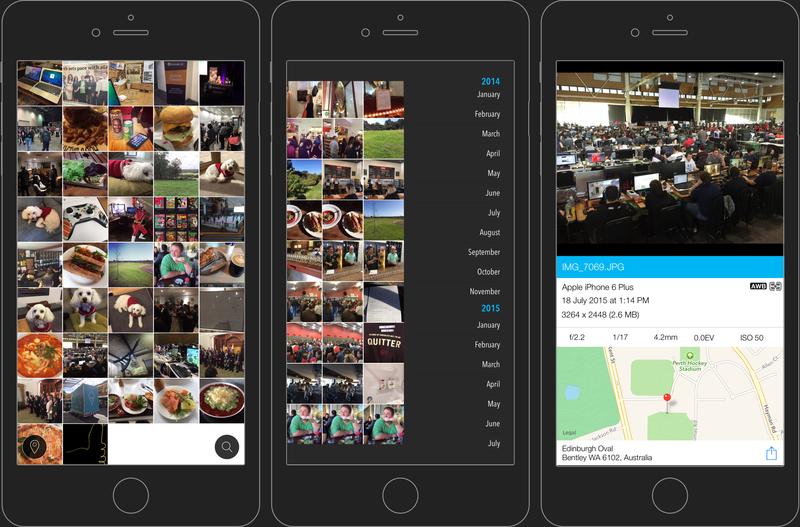 Elegantly designed and very thoughtfully crafted, #Photos is an app developed by beyondf that helps you manage all of the photos on your iOS device. Unlike the system Photos app, #Photos brings order to your chaotic mess by extracting the timestamp from each photo, and it breaks up the list into time blocks of your choosing (months or days), visually separating them in the list. Additionally, by simply swiping to the left, a menu appears that makes it possible to instantly jump between batches of photos taken in specific months, making it far easier to navigate your photo collection than the system Photos app. On top of that, swiping to the left reveals a menu that will let you edit your photo albums as well. Again, much faster than the standard system app. If all that wasn’t enough, when actually viewing your images, #Photos provides an absolute plethora of features to extend what you can do with your photos. You can share them with the standard iOS share sheet, send them directly to another app, add memos or tags, or even — perhaps most importantly — directly view all of the EXIF metadata embedded in that photo, including an embedded map of where the photo was taken. The level of functionality that #Photos provides is mind-blowing. #Photos is awesome. This is how the default Photos app should have worked from the start. Apple should be watching this and taking notes for iOS 10. All of us at Realm are incredibly happy to see our technology contribute to an app that will help people every day with one of the most common and usually frustrating tasks on the iOS platform. We wish them all the best, and we can’t wait to see the app grow from this point onwards!